Russia is to spend almost $500m (£300m) next year reinforcing its military bases in Georgia's breakaway region of Abkhazia, the prime minister says. Vladimir Putin's announcement came as he visited the region for talks. He said Russia was committed to defending and financing the small strip of land in Georgia's north-west corner. Georgia reacted angrily to the visit, calling it "yet another provocation" and an attempt to "escalate tensions in the Caucasus region". The UK also condemned Mr Putin's announcement, saying it ran contrary to wider international efforts to support a negotiated solution in the region. Moscow officially recognised the independence of Abkhazia and South Ossetia following the war a year ago between Russia and Georgia. The only other country recognising the regions' independence is Nicaragua; both areas are still widely considered to be part of Georgia. The BBC's Richard Galpin, in the region's main city, Sukhumi, says Mr Putin arrived to a hero's welcome from relatives of those killed in the 1992-1993 war between Abkhaz separatists and the Georgian government. Some called him a guardian angel and thanked him for last year's intervention against Georgia, our correspondent reports. Mr Putin laid a wreath at a memorial to those who died in the first war, then visited a hospital with Abkhazia's separatist leader, Sergei Bagapsh. Speaking ahead of the trip, Mr Putin said Russia would expand its bases in Abkhazia and build a "modern border-guard system" to guarantee the security of the two breakaway regions. All this would cost about 15-16bn rubles ($463m; £280m), he said. The build-up of Russia's military presence in Abkhazia and South Ossetia is regarded by Georgia as a clear violation of its sovereignty. But, at a joint news conference in Sukhumi with Mr Bagapsh, Mr Putin said Russia's stance would not change. "Russia is showing and will show economic, political and, if necessary, military support to Abkhazia," he said. Defence Minister Anatoly Serdyukov, also in Abkhazia, said Russia currently had a total of 3,636 military personnel in the region and "a bit less" in South Ossetia. The Abkhaz government wants Moscow to build a big navy base south of Sukhumi, which could ultimately provide an alternative home for the Russian Black Sea fleet currently based in Ukraine, a senior Abkhaz official told the BBC. Georgia expressed its "strong protest" at Mr Putin's visit, which it said demonstrated Russia's defiance of "universally recognised norms and principles of international law". 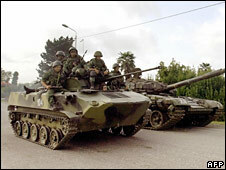 Last year's five-day conflict erupted on 7 August as Georgia tried to retake control of South Ossetia. Russia quickly repelled the assault and pushed its forces deeper inside Georgia, before pulling back.